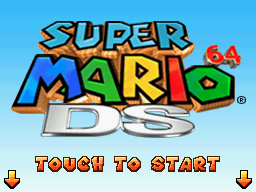 Super Mario 64 DS launched with the Nintendo DS in both regions. 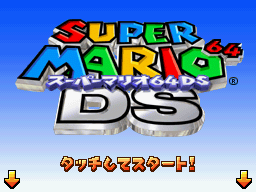 On the top screen, the Japanese version's title logo has a metallic look, while the U.S. version brings back the wooden "Super Mario" letters and shiny "64" from the Nintendo 64 game. The following are the new bosses introduced in Super Mario 64 DS. For more enemy names, please see the Super Mario 64: From Japanese to English page. Big Boo: "Teresa" comes from the Japanese verb tereru, which means "to be shy." Chief Chilly: Donketsu means "lowest rank." Goomboss: "Kuri" comes from "Kuribō," the Japanese name for Goombas. あいつをさがせ！ Aitsu o Sagase! Search for Them! Wanted! はなうらない Hana Uranai Flower Fortune-Telling Loves me...? ハナチャンをさがせ Hanachan o Sagase Hana-chan Search Which Wiggler? ハテナカード Hatena Kādo Question Card Psyche Out! Tox Box Shuffle (Yoshi): "Onimasu-kun" is the Japanese name for Tox Box. Onimasu literally means "demon box." Which Wiggler? (Yoshi): Wigglers are known as "Hana-chan" in Japan. Hana means "flower," which refers to the flower on its head. Intense Coincentration (Wario): "Gamaguchi-kun" is the Japanese name for Money Bags, the coin purse-like enemy seen at the start of this minigame. Gamaguchi means "coin purse." Level names in light blue have been changed from the Nintendo 64 version. You can see the original names by holding your mouse pointer over the colored text. Bolded rows are levels that weren't in the N64 version. Note: These are the same as the N64 version, except for the added space in Tall Tall Mountain's Japanese name. Note: The very first level, "Big Bob-omb on the Summit," has a different objective than the similarly-titled level in the Nintendo 64 version. "Big Bob-omb's Revenge" is essentially the original "Big Bob-omb on the Summit" with a different name. ５つぼし！シルバースター 5 Tsuboshi! Shirubā Sutā 5 Silver Stars! 5 Silver Stars!